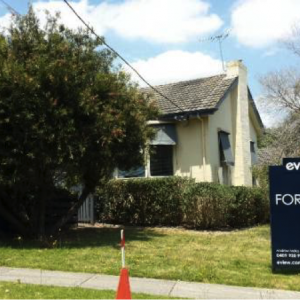 A Pre Purchase Building Inspection by House Inspections Melbourne recently investigated a single story dwelling in the beautiful seaside town of Mornington. Whilst the idea of a sea change might be exciting an exciting notion, barreling into a purchase without an inspection could be costly. The information that a pre purchase building inspection can reveal will help you as the buyer negotiate on price and conditions, as well as gain an understanding of what maintenance or renovation may need to done to the property. Here, knowledge is power and can be a big money saver down the track. Pre purchase building inspections look at the structural integrity and condition of the ceiling, walls, windows, doors and floors so you know the house has been thoroughly reviewed. An initial look at the walls revealed that the property was in good condition for its age, but high moisture levels adjacent to wet areas indicate a possible waterproofing leak leading to structural decay and a timber pest problem. An examination of the entryways exposed a dangerous set of French doors where the inspector recommended a complete decommission of the doors due to decay and safety issues. Surveyance of the floors noted minor decay, uneven flooring, and squeaking; with wet rot also detected in some skirting boards. Pre purchase inspection of wet spaces (bathrooms and laundry) is especially important as these can often be problem areas, and can be difficult for the untrained eye to see. In the Mornington property our independent building inspector found that the lack of waterproof tiles, and damage to those already installed pose a risk to water penetration. This can cause additional wet rot decay, which is likely to have already infiltrated the wall lining. The inspection also attributed the decay to poor sealing and inadequate shower screening. A qualified plumber is recommended by House Inspections Melbourne to fix leaks in the laundry sink and a potential problem with the waste pipe in the toilet. As well as the interior, it is essential that an inspection of the property’s roof be undertaken before considering the purchase of the house. A closer look at the Mornington property’s roof framing revealed inadequate support struts and sagging where a licensed builder is recommended to offer suitable rectification. The condition of the external roof tiling has aged, gutters and verandahs are significantly rusted, and potential asbestos suggests that professional maintenance is urgently necessary. Upon inspection of the sub floor damp soil was exposed which can be linked to a number of issues. The conditions on the day of inspection were dry meaning there is a potential drainage issue, which creates an environment conducive to termites. Overall a report of the property that was inspected in Mornington concluded that when compared to buildings of similar age and construction the level of both minor and major defect was high. After comprehensive visual examination the house was recognised as below average, suggesting significant defects and long-term neglect requiring significant repair. Luckily, House Inspections Melbourne can put you in touch with the right tradesmen if you are looking at making renovations, improvements or seeking further advice. 3 Balmoral Avenue Wesburn , Victoria, 3799. 3 Powlett Street Melbourne , Victoria, 3000. House Inspections Melbourne © 2018 - 2020. All Right Reserved.